Welcome to the www.DiecastAirplane.com loyalty points program. Earn 1 point for every dollar spent. Each point is worth $.01. Example: Place a $100 order and you earn $1 toward a future purchase. Loyalty points may be used on any future purchase within the next year. To use loyalty points: Simply add items to your shopping cart then proceed to checkout. In the payment type section choose "reward points" and you will see how many points you have and if you click the apply button these points will be applied as payment towards your order. 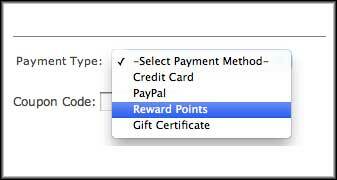 Next, select either credit card or paypal to complete the payment and checkout. We are in Beta mode on the reward points system, so let us know if you find a glitch or have any problems. Please Email info@diecastairplane.com and we will get right back to you. The www.DiecastAirplane.com program terms and conditions may be amended at any time without prior notification. We may suspend or terminate this program at any time without notice or liability. Points are not transferable and expire one year from date of purchase.